Scouting in East Midlands is about Scouting in the official region of East Midlands. It is largely represented by the Scout Association of the United Kingdom and some Groups of traditional Scouting including the Baden-Powell Scouts' Association. There are four student associations at various universities in the region, each of which is affiliated to the Student Scout and Guide Organisation (SSAGO). These are Students of Leicester Universities Guides and Scouts, covering the University of Leicester and De Montfort University, Loughborough University Scout and Guide Club covering Loughborough University, Northampton University Scouts And Guides, covering the University of Northampton, and Society of Nottingham Guides and Scouts covering the University of Nottingham. The 1st Nottingham (YMCA), 1st Buxton, 1st Market Harborough, 2nd Chesterfield and 4th Derby (Derwent) Scout Groups claim to have started in 1908. The Scout Association in East Midlands is administered through five Scout Counties, Derbyshire Scout County, Leicestershire Scout County (including former Rutland Scout County), Lincolnshire Scout County, Northamptonshire Scout County and Nottinghamshire Scout County. Derbyshire Scout County is a Scout County of the Scout Association covering the administrative County of Derbyshire in England. The town of Glossop in the far North West of the county is not included in the County but in the Greater Manchester East area instead. Scouts from all over Derbyshire marked the centenary of Scouting in August 2007 at Sunrise ceremonies renewing their Scout Promise. Derbyshire villages are unusual in holding Well dressings during the summer. In 2005 the well at Whitwell had a theme acknowledging Peak 2005, Derbyshire's International Scout and Guide Camp at Chatsworth Park. Derbyshire Scout County is responsible for organising the Four Inns Walk, an annual competitive event over the hills of the southern Pennines, the Kinder Walk of approximately 29 km and the Kinder Challenge (new for 2008) of around 16 km. Leicestershire Scout County is a Scout County of the Scout Association covering the administrative County of Leicestershire in England. In the 2007 Centenary year, the BBC investigated the relevancy of Scouting in Leicestershire. There is a Leicestershire Scouts Sub Aqua Unit (LSSAU), a Scout based diving group providing experience in diving and snorkelling for all members of the Scout Association. It was formed in 1982. In 2008, the Leicestershire Explorer County forum was started, to discuss Scouting issues in the county. This forum was responsible for the setting up of the county groups of the popular social networking site 'facebook'. Each district is represented by two of its Explorer scouts on the County Forum. The Current County commissioner is Byron Chatburn, who started his 5 year warrant in 2009. Leicestershire Scout Headquarters is on Winchester Road, Blaby. Lincolnshire Scout County is a Scout County of the Scout Association in the United Kingdom, covering the counties of Lincolnshire and Rutland.. In 2007, the Centenary Year of Scouting, the County appointed local presenter and broadcaster Ian Cashmore as a Media Development Manager to actively promote Scouting activities through the media. He was also involved with national scouting media on Brownsea Island and the sunrise camp. Rutland, previously a separate Scout County covering the County of Rutland. It was one of the smallest Scout Counties in the United Kingdom. 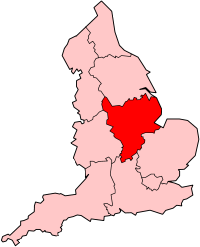 It is now a District in Lincolnshire. It is bounded on the west and north by Leicestershire, northeast by Lincolnshire, and southeast by Northamptonshire. The new district has 7 Scout Groups along with an Explorer Scout Unit and a Scout Network. The Lincoln District has a Scout Band. It is the only Scout Band in the County. Northamptonshire Scout County is a Scout County of the Scout Association in the United Kingdom, covering the county of Northamptonshire. A Northampton Scout Amateur Radio Group was formed in 1981. Northampton District runs the Northampton Scout Gang Show. Grafton Scout District basically covers the area of South Northants. Northampton District was created in 2005 following the merger of Northampton East, West and Brixworth districts. When merged it had 27 groups and about 1600 members. By 2007 it had grown to 1800 members. Currently it has 24 Groups and 1700 members. Nottinghamshire Scout County is a Scout County of the Scout Association in the United Kingdom, covering the county of Nottinghamshire. In 1980, a group of Cub Scouts from the 2nd Sutton St Mary’s troop wrote to the Television programme Jim'll Fix it asking to have a meal in an unusual place. The show sent them, complete with packed lunch, to ride the Revolution at Pleasure Beach Blackpool with hilarious results. The clip became one of the most requested on British television. The stunt was repeated in 2007 with the same former Cubs for Jim'll Fix It Strikes Again, with similar results. The County runs Nottinghamshire Scout & Guide Gang Show. Birch Hill Plantation in Bolsover is ideal for those wishing to walk the Peak District and the Sherwood Forest, with several local walks along old disused railway lines that are all linked to provide either long or short hikes in a traffic free environment. The site is 1-acre (4,000 m2) of grassland that is sheltered by woods and can camp up to 120 people. Drum Hill is a 47-acre (190,000 m2) site located in Little Eaton that has three open areas for camping and a choice of three residential centres. Large enough to hold 1,000 campers, the site offers a number of activities including abseiling, archery, an assault course, climbing wall, mountain bikes, orienteering and shooting. Gradbach is a greenfield site located near the village of Flash, the UK's highest village in the heart of the Peak District between Leek and Buxton. As well as large camping areas, there are two buildings available for hire - the Farmhouse and the Cottage. Great Hucklow Scout Centre is a centrally heated converted playhouse located in Great Hucklow providing indoor accommodation for 54 people in a combination of bed and bunk bedded rooms and dormitories. It comes with a fully equipped kitchen, toilet facilities which include hot showers, lounge area, dining room and drying rooms. There is a grassed area outside suitable for games. The site is ideal to use as a base for those wishing to climb, cave, hike or mountain bike in the surrounding area. Spitewinter is positioned on the edge of the Peak District National Park in Chesterfield. The site has 4 acres (16,000 m2) of sloping woodland with open camping areas. The camping areas are served by a purpose built ablution block, which has hot water and coin-operated showers. There are two accommodation huts, both of wood construction. The Mill Pond is part of the North Leeds Estate. This back-to-basics site accommodates a maximum of six small tents. There are no facilities of any description offered on-site but would make a suitable overnight stop for a hiking party. It is operated by the Peak District National Park Authority. Fox Coverts is a campsite between Leicester and Hinckley, roughly 1 km from Kirkby Mallory. Fox Coverts has been scout owned for almost 100 years, and is now managed by the Hinckley District Scout Council. Fox Coverts is a well equipped campsite with a 9m Climbing tower, traverse wall, Low Ropes, Spiders Web and fill archery and shooting ranges, as well as a large 'theatre like' campfire area, and a homely main building "The Wilson Building". Fox Coverts has numerous clearing style campsites of various sizes, and all with their own fire area. 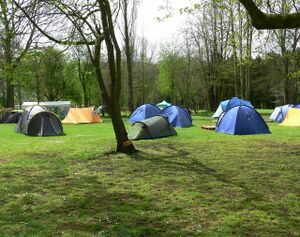 Johns Lee Wood is a woodland campsite, in the North West Leicester scout district. It lies near to the village of Markfield and is a stone's throw from Bradgate Park. The site has its own climbing tower, air rifle and archery ranges and a caving complex among other facilities, as well as several huts and clearing-style camping areas. The Oaks is located in the heart of Charnwood Forest, close to Oaks in Charnwood. It is a large field, with woodland along one side, and has a variety of activities available from climbing to archery, grass sledging to tunnel trail. Ullesthorpe campsite is in South Leicestershire, and was once the home of Leicestershire Scouts Training. A mixture of woodland, huts and fields. Willesley is a Scout campsite that was once a stately home near Ashby de la Zouch in North West Leicestershire. The hall fell derelict and was bought by the local Scout District in 1952 along with a small area of land. The hall was demolished and turned into a Scout campsite. Further land was later bought by the Scouts, with other areas becoming a fishing lake and a golf course. Willesley Campsite is located 1-mile (1.6 km) south west of Ashby de la Zouch, Leicestershire. It occupies 14 acres (57,000 m2) of the old Willesley Hall and estate from which part of the original gatehouse is still visible. The site has open fields, patrol areas, a coniferous wood its own church. Holwell Pastures is a field campsite north of Melton Mowbray and managed by Melton District. Lincoln Scout Association District has a camp site at Sudbrooke. Grantham Scout Association District runs the Dukes Covert Campsite. The former Rutland County site at Shacklewell Hollow, on the A606 between Empingham and Stamford can camp up to 100 people in four and a half acres of grassland and woods. Northamptonshire Scout Association County owns Yr Hen Felin Cottage, a former Youth Hostel at Cynwyd, North Wales. It was purchased in 2007. This page was last edited on 6 May 2012, at 13:53.